Hi! Thanks for stopping by to look at the second of two sneak peeks at the Karber Rubber Stamps that are being released this Saturday at Sparkle Creations Rubber Stamps! Yesterday, some of the other Design Team members previewed “Mummy Oliver.” Visit the SCRS blog to check him out! 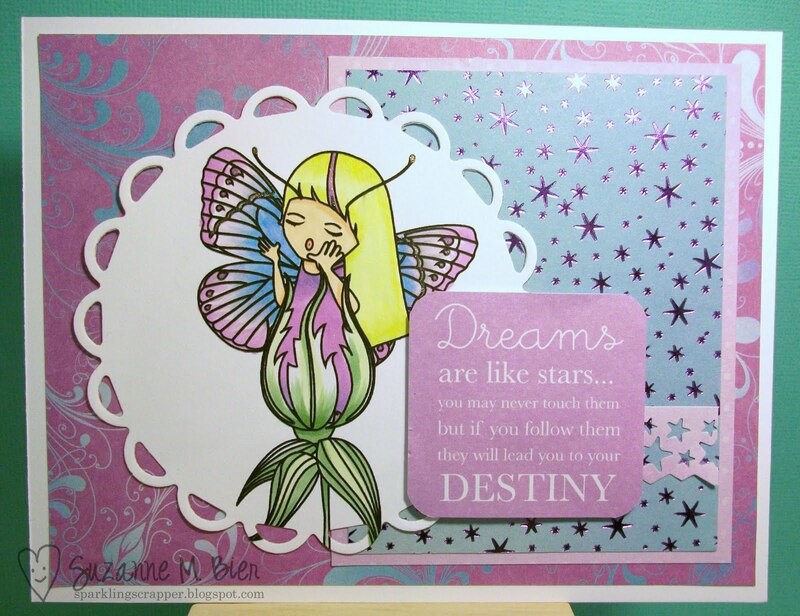 Supplies: image (Karber Fairy – Sparkle Creations Rubber Stamps), Spellbinders die, paper and sentiment die-cut (KaiserCraft), Copic markers, border punch, card base. Be sure to visit the rest of the SCRS designers for more peeks of Fairy. Sparkle will be giving away a Fairy stamp to one lucky person! For a chance to win, you need to comment on all of the designer’s blogs (list below). Then head on over to the SCRS blog and comment on the Fairy post. You have until midnight EST each day to comment. The lucky winner will be announced the following day! I hope you’ve enjoyed these two previews of the Karber stamps that will be released along with the Sparkle Creations Rubber Stamps this Saturday, September 10 in the SCRS Store! The rest of the SCRS Design Team has one more stamp to preview for you this week…visit Sparkle Creations Rubber Stamps tomorrow for all the details! Suzanne, you've done such a beautiful job with this newbie! Suzanne, she is so cute! love all the purple, gives this a dreamlike feel.